Here are just a few hot trends that I think are not going away anytime soon. 1. Wallpaper is back. In a BIG way. I’m not talking about tiny flowers or your grandma’s wallpaper. 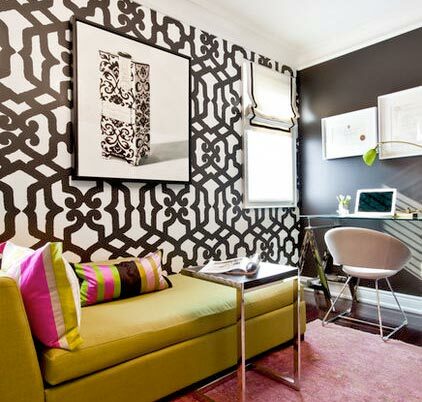 Large bold patterned wallpaper is the look. 2. Shades of orange are still hot this year. I’m seeing orange used as a pop of color or an accent wall. I love the shade of pumpkin and used it in my living room. 3. The Collected Look is strong thanks to Nate Berkus. The baby boomers have been doing this for many years but he showed us how to do it in a more modern way. If your rooms look like something out of a catalog then it’s time to shake it up. Remove items that are too matchy matchy and go to a consignment store or flea market and introduce new/old things. 4. If you want impact then this final trend is for you. Overscale items make a statement. A large light fixture, I love the super large drum shades especially if you have high ceilings. I’ve always loved large artwork maybe because I’m an artist. 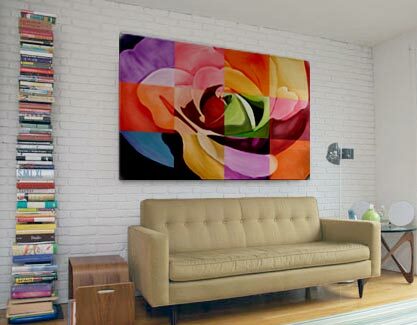 Here is one of my large colorful paintings in a neutral setting. That’s impact!